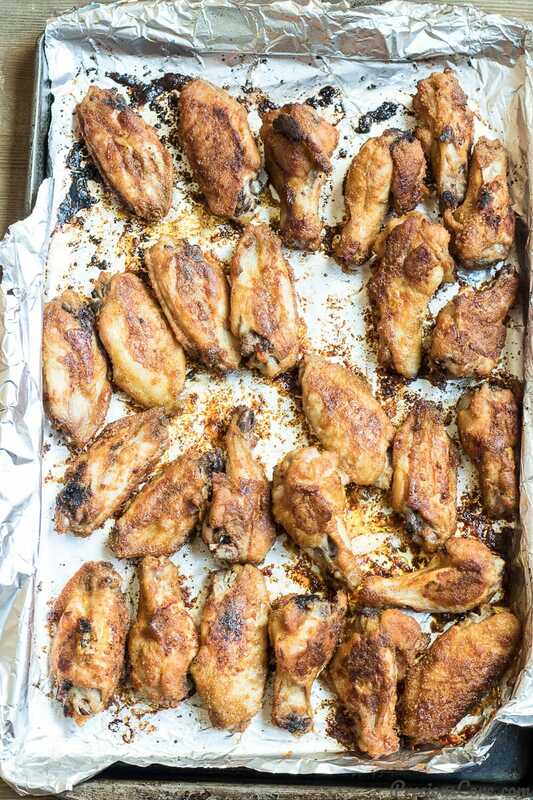 These oven grilled chicken wings are so good that our friends dubbed them “Precious Chicken”. Trust me when I say you’ve never had chicken wings like these. 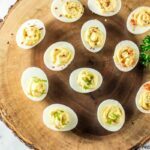 They are incredibly tasty and are equally so easy to make! Enjoy these super crispy grilled chicken wings on their own (seriously) or pair with your favorite side. My favorite side is some fried plantains and some pepper sauce or spicy/herby mayo. Enjoyment at its peak! I’m gradually settling into our home. Gradually because unpacking is almost just as hard as packing so I’ve resolved to unpack just one box per day so I can diligently arrange the stuff from the box and also have time to live/breathe. Part of settling in is checking out the grocery stores and of course, cooking! I bought some chicken wings during my last shopping and I thought it will be the perfect time to show you guys my ” Precious Chicken” recipe. There’s a story behind why these oven grilled chicken wings are called “Precious Chicken”.Sooooo one day our family friend came visiting and I wanted to serve him something but I hadn’t cooked. BUT I had chicken wings which I planned on making that evening. And I also had my homemade suya spice on hand. Soooo I cut the tips of the wings discarded them then split the wings in the middle. I washed them and patted dry. Then I coated all the wings with my suya spice. I put them in the oven to grill and boy oh boy it turned out delicious! Our family friend was so in love with the chicken that he took pictures of it and sent to his wife and they requested I make more a few days later. Since then, they always request for these oven grilled chicken wings, calling it ” Precious Chicken.” So that is how “Precious Chicken” came about. 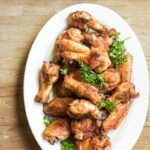 I thought now would be the perfect time to share with you guys this very special oven grilled chicken wings recipe. 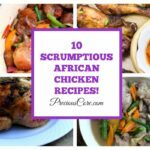 The chicken is crispy on the outside, moist on the inside, so tasty with bright and bold flavors with a glistening appearance. Epic in every way! And you guys, anyone can make this! It is so easy. I mean, what could be difficult about rubbing chicken in premade spices?? The key here is to have my homemade suya spice blend which I use as my grilled chicken wings rub. 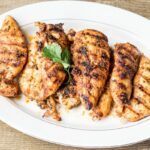 The West African suya spice blend which is primarily used on street-grilled beef is what makes this chicken truly special. So if you haven’t made it before, check out the recipe and go make some! The dry spice rub is the heart of this recipe. You could cut corners and buy suya spice from Amazon or an African store near you but truth be told with storebought suya spice, your chicken will taste great but not epic! My suya spice is actually quite easy to make at home. Just take a trip to the spice aisle in your grocery store and you will find the spices you need. Make a big batch because suya spice goes so well with meat, chicken or fish! 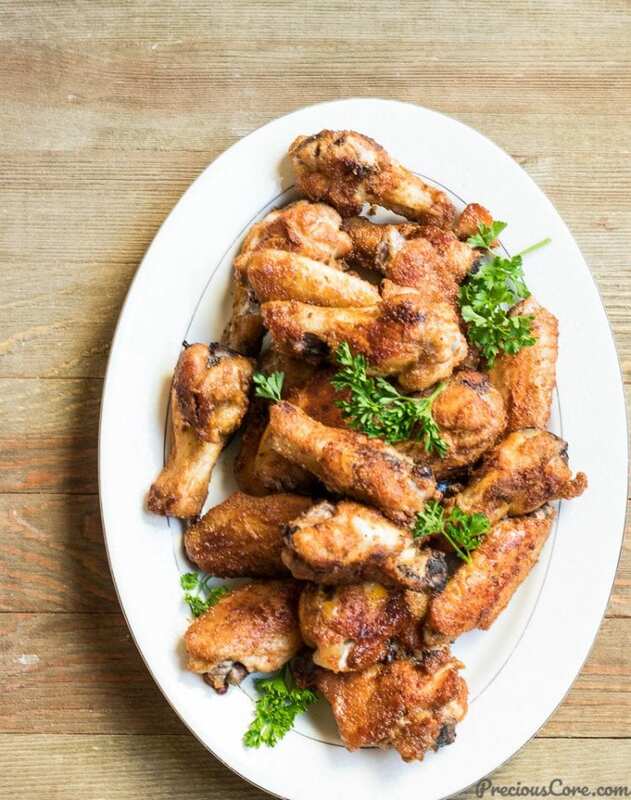 To cook chicken wings in the oven, set your oven to broil which is like the oven substitute for grilling then cook the wings for 30 minutes in total making sure to flip them to the other side after the first 20 minutes. 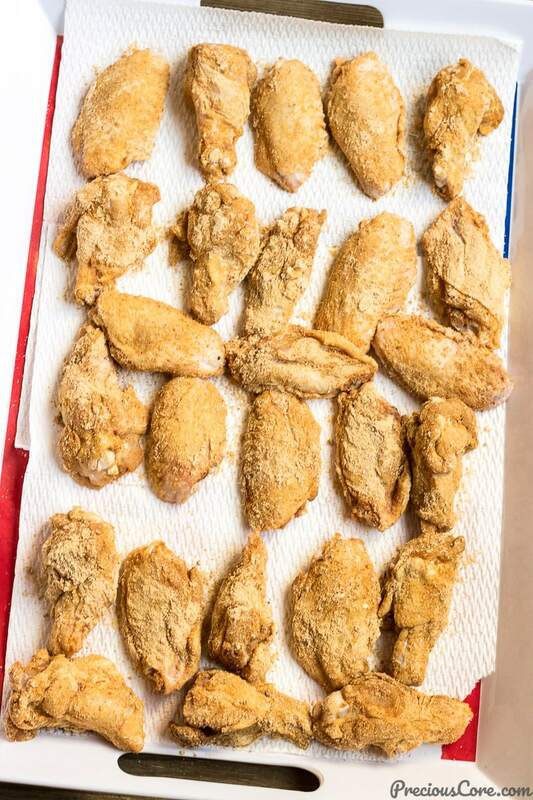 Broiling gives the chicken wings a nice crust on the outside. 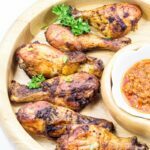 My grilled chicken wings rub, also known as suya spice consists of ginger powder, garlic powder, ground white pepper, onion powder, peanut powder, paprika, salt and seasoning cube (or bouillon powder). All ingredients can be easily gotten from your grocery store. 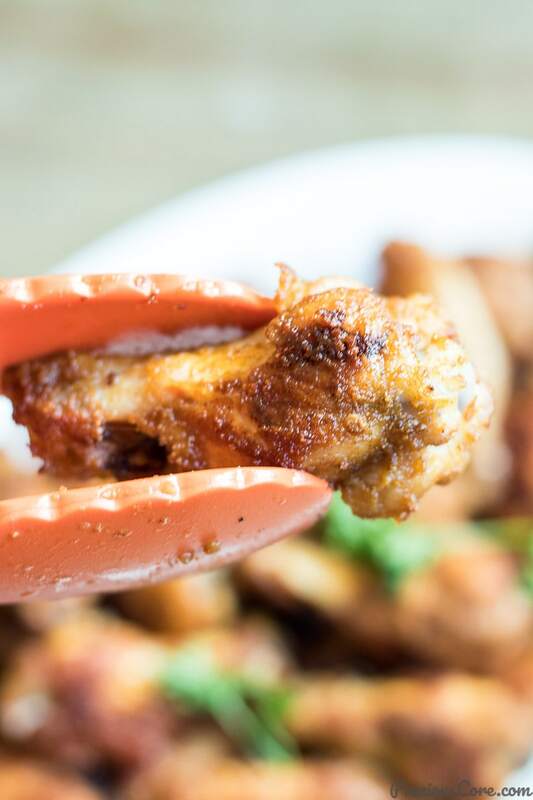 Hope you enjoy these oven grilled chicken wings AKA “Precious Chicken” as much as we do! 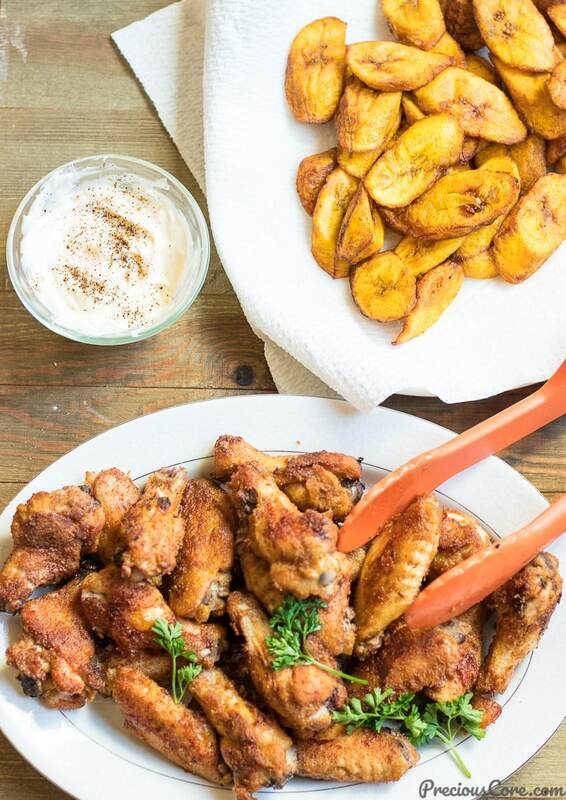 These oven grilled chicken wings are epic in every way. Crispy on the outside, moist on the inside and super tasty with big bold flavors! Enjoy these oven grilled chicken wings on their own (seriously) or pair with your favorite side. My favorite side is some fried plantains and some pepper sauce or spicy/herby mayo. Enjoyment at its peak! 3 pounds chicken wings (about 1 1/2 kg) The wing tips should be cut and discarded and the wings should be cut in the middle. Cover a large baking tray with foil paper then pour oil on top. Rub the oil to ensure that it gets to every corner of the tray. 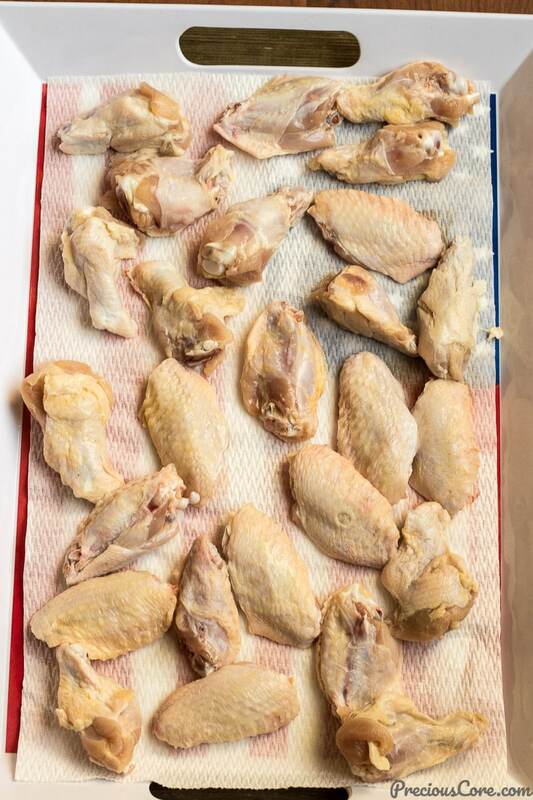 Wash chicken wings thoroughly then pat dry with paper towels. Sprinkle seasoning cube and salt over the wings. Toss well to combine. Place the suya spice on a plate then place a chicken piece on the spice and move around to coat completely. Repeat process with the remaining pieces of chicken. Place each piece of chicken on the prepared tray. Note that the chicken should all be placed on a single layer for even cooking. Do not double one chicken on top of another. Set the oven to broil then place chicken in and let it cook for 20 minutes. After that, flip to the other side and let it cook for another 10 minutes. Remove and serve warm. 1. I used party wings in this recipe which means that the wings were already cut for me. If you are using full chicken wings, cut and discard the wing tips then cut the wings in the middle. 2. Click here to see how to make suya spice. 3. You could coat the chicken in the spice rub and place in the fridge for easy grilling the next day. I love chicken thighs and wings when dry fried. Well I also trust your grilling and you spices. This grilled version is as good as the fried one! So crispy on the outside! Hi Precious. I’ve been following you on IG for awhile now and love your posts. Im so excited to try these for super bowl Sunday! Thanks for the recipe.